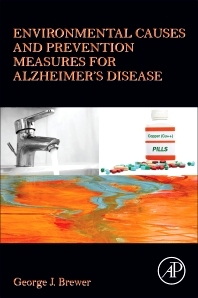 Environmental Causes and Prevention Measures for Alzheimer’s Disease examines the increased incidence of the disease in developed countries and aims to educate neuroscientists, medical practitioners and other educated individuals on new insights into environmental causation, primarily metals. This book looks into the web of evidence around the hypothesis of copper toxicity and the additional role that a high fat diet plays in disease progression and cognition loss. The data and its implications are discussed, along with potential prevention measures. This book will generate excitement and interest among neuroscientists, medical practitioners and other biomedical researchers. Dr. Brewer has a bachelor’s degree in pharmacy and a medical degree. After completing his internship, fellowship and residency at the University of Chicago, he accepted a position at the NIH at Michigan’s Department of Human Genetics in 1963. He became an assistant professor of internal medicine and then full professor in five years, in the Departments of Human Genetics and Internal Medicine. He also was an adjunct professor of veterinary medicine at nearby Michigan State University from 1989 to 1995. During this time, Dr. Brewer developed zinc as a therapy for Wilson’s disease and received U.S. FDA approval. He is currently developing a drug for multiple therapeutic purposes. He has held memberships in more than 15 professional societies, serving as president of the regional chapter of the American Federation of Clinical Research, the American College of Nutrition and the International Society for Trace Elements Research in Humans. He has authored 342 publications and received numerous awards including the Distinguished Alumni Award from the University of Chicago, the Raulin Award from the International Society for Trace Element Research in Humans, and the Master Award from the American College of Nutrition. He is a Fellow in the American Association for the Advancement of Science.